Lingerie & Swimwear specialists for over 25 years. The Barclay & Clegg stores are owned and managed by Maureen Esterhuysen. She believes in offering value to her clients while they experience the ambiance of her stores. With this in mind, the staff are specialist lingerie and swimwear consultants, which ensures that personalised time is spent on you getting a professional fitting and expert advice regarding options available for your specific body type. She has been in the industry for 20 years and believes that quality comes first and foremost. Imported lingerie is now no longer out of your reach, as they have chosen the best collections available to be offered to you, right on your door step. Lingerie and swimwear is imported from France, Germany, Italy, Spain, England and the USA. The product range is vast, offering you a wide choice of styles for different occasions. Personalised time is spent with each customer to assess the customer’s needs (and wants!). Products are then recommended and a fitting is done to determine if the product is suitable for the customer’s body shape. Swimwear is offered all year round – it is always summer somewhere! The latest trends in fashion are sourced at the major lingerie and swimwear trade fairs. Curvy women with large bust sizes need not be restricted to bras which don’t offer good support. We have a beautiful range of lingerie and swimwear for the bigger busts where colour and lace are a priority. The stores interact with each other, so you benefit by having your size delivered to your store of choice, should the current store not have the specific size you need. Our underwear is of the best quality and is evident in the soft, comfortable fit as well as the trimmings – these are bras that you don’t want to take off at the end of the day. 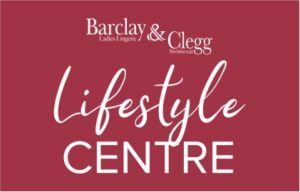 Barclay & Clegg offers a comfortable, intimate environment with a fragrance in the stores exclusive to Barclay & Clegg and display monitors showcasing the latest videos and images from the industry.